Performance and elegance are the two words into which one could summarize Shama's "Fashion 116." Designed by the Tuscan, Fashion Yachts Group and built by the Egyptian Shama Yachts shipyard, the one word that the whole project revolves around is elegance. Clean harmonious lines match finely sought after elements such as the stern saloon which stems from the cockpit onto a terrace overlooking the sea. The view of the stern is striking where a full beam stairway leads to a minimalist styled area with comfortable sofas. The interior design with its choice of chromatic white for the furniture, flooring and bulkhead panelling, recalls its overall minimalist design styling. The refined modern interior decors mix well with the 116's hi-tech devices and for one, the sophisticated lighting system which runs longitudinally through every area. The upper deck hosts the main saloon with two white leather sofas at its centre so as to leave either side of them two passageways leading to a completely fitted out wheel house covering the yacht's full beam. On the lower deck there's the "open space" dining area which draws daylight directly through the wind screen, Access to the dining area is guaranteed by an elegantly shaped stairway with crystal steps and a stainless steel handrail. From here, the guests' sleeping quarters may be reached by proceeding towards the bows. 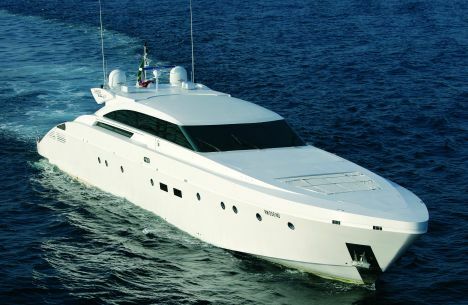 These consist of two enormous VIPs cabins and ensuite bathrooms, and another double cabin. Towards the stern, at the centre of the yacht at full beam there's the owner's master cabin with a decentred doubled bed, to port, next to an elegant bulkhead panel. On its starboard side there's the bathroom, with two sinks with retractable taps and walls entirely covered in mosaics even on the inside of the separate shower room. The crews' quarters are at the extreme stern of the yacht and include two cabins with as many bathrooms, a galley in stainless steel with a central multi purpose mess table. The Fashion 116's performance, by Shama, is ensured by three CAT or MTU engines coupled to hydro-jet twin discs. For further information please contact: Fashion Yachts Group, Piazza 185° Reg. Art. Folgore 2, 57128 Livorno; Tel: +39 0586.581796, Fax: +39 0586.589100, Web page: www.fashionyachtsgroup.it, email info@fashionyachtsgroup.it. Declared cruising speed: 32 knots.